Natasha Calis stars as Em in THE POSSESSION, a film directed by Ole Bornedal. Photo credit: Diyah Pera. Picture courtesy Lionsgate. All rights reserved. Rated: PG-13 for for mature thematic material involving violence and disturbing sequences. 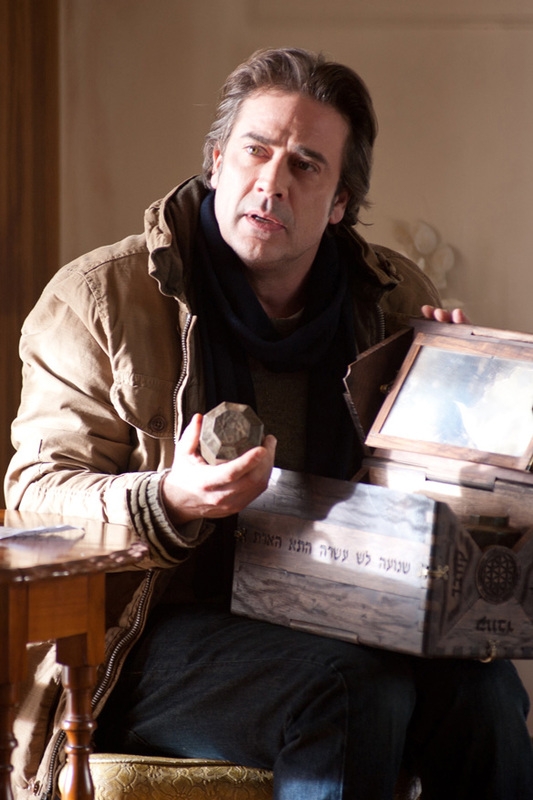 Clyde (Jeffrey Dean Morgan) and Stephanie Brenek (Kyra Sedgwick) see little cause for alarm when their youngest daughter Em becomes oddly obsessed with an antique wooden box she purchased at a yard sale. But as Em's behavior becomes increasingly erratic, the couple fears the presence of a malevolent force in their midst, only to discover that the box was built to contain a Dibbuk, a dislocated spirit that inhabits and ultimately devours its human host. Starring Jeffrey Dean Morgan (WATCHMEN) and Kyra Sedgwick ("The Closer"), THE POSSESSION is directed by Ole Bornedal (NIGHTWATCH), written by Juliet Snowden & Stiles White, and produced by horror master Sam Raimi along with Robert Tapert and J.R. Young. A Lionsgate and Ghost House Pictures presentation. From horror master Sam Raimi and legendary Danish director Ole Bornedal (Nightwatch, The Substitute) comes a contemporary supernatural thriller that is based on a terrifying true story of paranormal events -- and the unleashing of an ancient evil into our 21st Century world. The film chronicles the experience of one family over 29 days, after they acquire a mysterious antique container, and unsuspectingly let escape an insatiable demonic force that has been lying in wait to take full possession of a human soul. The descent into fear begins for the Brenek family at a typical weekend yard sale. Newly divorced father Clyde (Jeffrey Dean Morgan) is still getting used to life apart from his ex-wife Stephanie (Kyra Sedgwick), but he sees little cause for alarm when their youngest daughter Em (Natasha Calis) purchases a mysteriously inscribed wooden box that catches her fancy. Yet as soon as she does, awfully strange things start happening. Em becomes increasingly obsessed with the box -- to the point that she carries the curious object everywhere. Her behavior grows darker and darker, even dangerous. Yet try as he might, Clyde cannot separate Em from the box, not even when Stephanie begins to believe it is causing their daughter to lose her mind. Plagued by one disturbing and inexplicable event after the next, the family is about to unearth the truth of what is really happening to them: they have opened a Dibbuk's Box . . . and the dislocated spirit warned of in ancient Jewish folklore that had been trapped within now seeks to devour its human host. 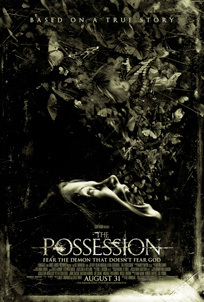 Lionsgate and Ghost House Pictures present The Possession, starring Jeffrey Dean Morgan (Watchman) and Kyra Sedgwick ("The Closer"), directed by Ole Bornedal and written by Juliet Snowden & Stiles White. The film's producers are Sam Raimi (The Evil Dead, Drag Me To Hell, the Spider Man series) Robert Tapert and J.R. Young. Throughout history, one of the darkest and most relentlessly persistent of human fears has been that of possession -- the blood-curdling idea that your body and mind could be overtaken by a hungry, inhuman force with a sinister will of its own. All manner of demons and phantoms have been rumored to prey on our souls, but unique among them is the Dibbuk. A Dibbuk (which literally means "cleaving to" or "an attachment") is said to be a sinful spirit wandering in limbo, which survives by fusing itself to a living person and inhabiting their very flesh. Dibbuks choose their human hosts carefully. Explains Jewish Theological Seminary professor Edna Nahshon, the typical human host is "usually a vulnerable person, which often means a young woman, even a girl, or someone who has a certain weakness." And cautions expert Ilana Abramovitch, editor of "Jews Of Brooklyn" and longtime manager of The Museum of Jewish Heritage, "once it finds a resting spot in the body, it is not ready to go. It wants to stay there. Because you have to understand the dibbuk is trying to escape punishment for its sins. It's looking for a resting place." Written about in Jewish folklore consistently since the first recorded case in 1602, carpenters over the ages have built special arks or boxes said to trap the Dibbuks and keep them from tormenting human hosts. Symptoms of Dibbuk possession are similar to that of demonic possession in other faith traditions. According to Abramovitch, "there are violent convulsions, odd body postures. Things come out of the mouth of the person that they would normally never speak. They could be lewd, transgressive things. And in fact the person will sometimes speak a language that they don't know, that only the Dibbuk knows. This is a phenomenon called 'xenoglausia'." She goes on to explain that although exorcisms are possible and often carried out by a small subset of Rabbinical mystics, "Trying to get rid of the dibbuk is a very, very painful exercise. Having a dybbuk inside you is painful and can even lead to death." Dibbuks have been documented as recently as a 2010 case in Israel that showed a graphic exorcism in a You Tube video. Nahshon explains how much attention that case captured, "because it was so anti-modern, because we thought these things do not happen anymore. But they do." They also happened right here in America in recent years. In 2004, Los Angeles Times journalist Leslie Gornstein uncovered the story of a man who was auctioning a particularly disturbing item on Ebay: what he claimed was an authentic "Dibbuk Box," one that had beset each of its owners, including himself, with so much unholy terror that he was desperate to be rid of it. His story recounted the box's harrowing effects on its owners to date. Hair fell out. Nightmares stalked entire households. Sudden illnesses struck some owners down, while others saw freakish visions and heard unexplained voices. And every single owner reported a string of horrific bad luck that the seller likened to "all hell breaking loose." When the long-trapped Dibbuk is released from its box to menace the very soul of young Em Brenek, the only thing that stands in its way is her father, Clyde, who at first is distracted by trying to start a new life as a single, divorced dad who has become too accustomed to putting work before family. Only when he watches his daughter's seemingly start to disappear inside her own body, and her innocence replaced by an overwhelming malevolence, does he being to realize how much his family means to him. Taking the role is Jeffery Dean Morgan, known for such films as The Watchman and Texas Killing Fields, as well television roles in "Grey's Anatomy" and "Supernatural." Says Robert Tapert: "Clyde is a man who when we first meet him is driven by ambition. He loves his family, but in the course of the film he has to draw on strength he didn't know he had to regain his possessed daughter. I think you really believe Jeffrey's journey as an imperfect guy trying to fight to get what is important in his life back. You relate to him and you root for him to succeed against a supernatural force that challenges all his beliefs." Morgan was drawn to the film's original approach to a story that would scare any parent down to the bone. "It didn't really interest me to do something that has been done before," he notes. "What was interesting to me is that surrounding this supernatural horror is a story about a family trying to survive. That makes all the jumps and scares add up to something powerful." He was also attracted to the character of Clyde, who begins the film dismayed by his ex-wife's new boyfriend only to uncover a horror that is unimaginably more threatening. "He's definitely a flawed character, which is good because those are the kinds of characters I gravitate towards," says Morgan. "He's first and foremost trying to be a good dad, but he's also a guy going through a lot stuff. He's a guy who is a little lost when this all begins. He has screwed up his priorities and now he is being forced to find them again under extreme duress." Morgan too was changed by the experience. He started out the film not really believing in ghosts and demons, but admits the Dibbuk Box unnerved him to the point of doubts. "I'll tell you this: I won't sit around mocking the box," he declares. "If so many people believe in its power, there might be something to it." Playing Clyde's newly estranged wife Stephanie is Kyra Sedgwick, well known from her long-lived, Primetime Emmy and Golden Globe winning run in the lead role of "The Closer." She, too, found the couple's situation intriguing -- facing a primeval force just as they thought they were separating forever -- and found Stephanie's initial reaction of blaming Clyde's inattentive fathering for Em's bizarre behavior very authentic. "Stephanie and Clyde think they've just put the final nail in the coffin of their marriage," Sedgwick explains, "and then their daughter becomes this angry, violent child which she never was before. I think Stephanie tries to see that there are rational explanations for that . . . until she finally realizes that her child is not alone. There is something else inside her." Like Morgan, Sedgwick was drawn to the humanity within the film's many moments of sudden shock and abject fear. "I think that all really good horror movies have their basis in strong characters and relationships," she says, "and I like that with this story, first you are moved and then you are very, very scared." Tapert was impressed with Sedgwick's ability to bring emotional honesty to a role filled with ratcheting anxiety. "Kyra brings a likeability to Stephanie and an understanding that her need to control things in the family comes from a place of love," he says. "She's a brilliant actress." Although Sedgwick says she greatly enjoyed working with her co-stars and Ole Bornedal, she too acknowledges that an eerie feeling hung over the production. "I'm not going to lie," she says. "There were some strange and creepy things that went on. But the most haunting thing for me were the incredible performances of these two little girls who play our daughters." 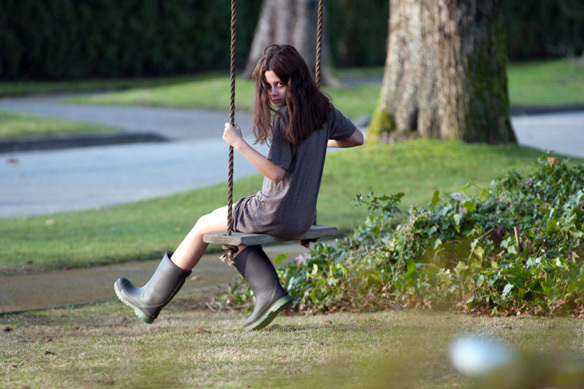 From the beginning, the filmmakers knew The Possession's potency would rest on finding a child actress who could take 11 year-old Em into the most starkly bone-chilling territory -- and the audience along with her through the raw experience of losing one's mind to a demon. To find someone who could pull all that off, Bornedal set out on an intense audition process. "I interviewed a lot of children and told them to pretend they were already possessed by an evil spirit," he explains. "It was during one of these interviews that Natasha Calis started crying. She started improvising very real emotions that would be attached to a girl going through an actual possession. It was one of the most heartbreaking casting sessions I've ever participated in. All of us had tears in our eyes. We'd never seen a possessed character like this before. That's what Natasha brings to this movie. She is not just an evil little girl -- there is a deep sadness in knowing that she is possessed and cannot control what is happening." Calis, who took her first role at age 7, was fearless as she dove into the role. She relished the chance to do what few children ever get to do -- take a character to the very edge. "It was exciting to me to play a possessed character because I really got to experiment," she says. "I got to play around with the whole idea of possession, I got to experience what it feels like and what you would do and what you would look like, and it was really thrilling." The young actress also took heart from Em's bravery, noting that she never completely gives in to the Dibbuk, struggling to keep it contained within in her no matter how ferocious it becomes. "She is constantly struggling with it, but as it is slowly devouring her, she's not quite sure what to do," Calis explains. Those struggles had Calis throwing violent rages, battling flocks of moths, gorging herself on raw meat and ultimately, undergoing a desperate exorcism at the hands of a young Hasidic master, but her enthusiasm and imagination never wavered. Says Jeffrey Dean Morgan of her performance: "Natasha blew me away more than once. The whole key to this movie was having a really believable girl in the role of Em and being possessed is no easy task for any actor, but Natasha has extraordinary talent." Adds Kyra Sedgwick: "Natasha really turned herself completely over to the process of being possessed and at the same time, allowed us to see into the depths of Em's soul as she battles the demon. Her pure love for the work was so exciting to see." Completing the Brenek family is Madison Davenport, known for her role on Showtime's series "Shameless," in the role of Em's protective big sister Hannah. Her resemblance to and rapport with Natasha Calis were both uncanny. "They really do feel like sisters, on and off the set. They even palled around like sisters," observes producer J.R. Young. "That was so important because it carries over into the storytelling." Fifteen year-old Davenport says she found what happens to Em in The Possession to be "all of your worst nightmares combined." She continues: "For Hannah, she's losing her sister to something nobody can explain. Her own little sister becomes the force tearing the family apart and bringing chaos into all of their minds." As for audiences, she expects they will be pulled into the fright and panic of Em's experience. "I think it's one of those films that after you see it, you'll go home and watch behind you on the stairs because you're going to feel something creepy is still with you," Davenport warns. "That will be very exciting to see." Throughout the long history of legends surrounding demonic possessions, there have always been those in every religion and culture who undertake to cast out whatever evil might infest the human soul. Urgently needing help and with nowhere to turn, Clyde Brenek engages the services of Tzadok, the street-smart but spiritual son of a Hasidic rabbi who knows the merciless ways that a Dibbuk can devour a human -- and despite his community's paralyzing fears, dares to help. To cast this unusual role, the filmmakers took an unusual route and recruited a non-actor: the Hasidic rap and reggae star who is known around the world by his Hebrew name Matisyahu. Ole Bornedal says he saw something organic and real in Matisyahu that made him think he could embody Tzadok despite having zero screen experience. "Sometimes casting has to do with intuition," he explains. "When I met Matis, it was clear that he was a very authentically religious young man. He didn't having the timing or the training yet of an actor, but he had so much charisma. There is a strong presence that he brings. He's a little bit off but Tzadok should be a little bit off, because he's essentially from another world outside the family's experience." Immediately, Sam Raimi became a big supporter of casting Matisyahu, despite the potential risks. "He's not just an unusual choice for shock value, I think he's really right for the film and I fought for that choice," says the producer. "Ole wanted to update the traditional view of the wise, old rabbi; and Matisyahu goes against all those expectations, and yet you believe in his faith. His performance was so true and original, he made the idea of an exorcist new to me." Matisyahu couldn't put the script down. "It was a page turner and I felt this was a part I wanted to do justice to," he says. "Tzadok is a Rabbi's son but he is also a little on the fringe in his community; he's more worldly, and I could relate to him on that level. It's a role that gives me the ability to do what I do -- which is to sort of connect my heritage with popular culture." The research the writers did on the Dibbuk and the little-known rites of Jewish exorcism impressed him. "The script was pretty on the money," he comments. "The Torah does speak of different types of demons and ghosts that can attach themselves to people." He was also intrigued by the fact that Tzadok decides to battle this relentless demon knowing he is up against near impossible odds. "Tzadok is this family's last hope, but at the same time, he really has no clue what he is doing," he explains. "All he knows is that he has to somehow channel this Dibbuk out of this little girl." Robert Tapert was taken aback by the freshness of Matisyahu's performance. "He's so sympathetic and likeable as a guy who chooses to the right thing even though he knows things could turn out very badly," he observes. Tzadok's attempted exorcism leads to one of the most menacing scenes in the film. "That scene was crazy, crazy, crazy," recalls Jeffrey Dean Morgan. "It was me, Kyra, Matisyahu, Natasha and Madison and at a certain point, it was like we were all just taken over by whatever was happening. It was weird, intense, very emotional -- and I walked away from it a little bit freaked out. Something weird happened, but weird is good for this film." The film's climactic exorcism scene was shot at a particularly haunting location: the abandoned Riverview Mental Institution, whose dilapidated buildings -- once rife with paranoia, fear and grim treatments -- still stand in Coquitiam, British Columbia. Built in 1913 and closed 70 years later, the buildings left behind are renowned for their instantly chilling atmosphere. "Riverview has its own history of odd occurrences," notes location manager Terry Mackay. "There's a feeling inside that is otherworldly, and because it's been vacant for so long, you have the sense of spirits or some kind of presence always there. I think it heightened all of our senses to film in there." Cast and crew were on edge on this set, with some even refusing to enter rooms that seemed to be especially cold or oddly forbidding. But for screenwriters Julia Snowden and Stiles White nothing could have been more thrilling than to see such an organically scary place become home to their high-tension scene. "There was a double eeriness to shooting in a location that people already say is haunted," muses White. "There were multiple layers of horror and weirdness. Along with the screaming and flashing lights of the scene, I have to admit, after watching the day of shooting, I had trouble getting to sleep that night." Other locations also seemed to fall under the film's spell -- one even burned to the ground (under circumstances that had nothing to do with the production) before shooting began. Production designer Rachel O'Toole added further touches of fright and foreboding to rooms that might seem ordinary but are filled with subtle, symbolic touches and the ability to shift into the nightmarish at any moment. Also adding to the contrasting atmosphere between family life and the hellish pursuit of a voracious demon is the work of cinematographer Dan Laustsen, who plays with light and shade throughout the film, breaking the usual rules. "Scary doesn't always take place in pitch black," Laustsen notes. "Some of the scariest things in our movie take place in bright light." The real-life owners of the Dibbuk Box recounted many horrors -- among them gruesome insect manifestations involving scorpions and cockroaches. When Ole Bornedal came aboard The Possession he made the decision to focus on an insect less commonly seen on film: the hypnotic and spooky moth. "Moths are weirder and more ancient than most insects and they seem to have something supernatural about them," the director explains. "The eerie flutter of their wings, the way they unexpectedly brush against your skin, it's chilling." And accordingly, Bornedal made a decision that would shock everyone on set -- the decision use live moths for the pivotal scene. He explains, "Having actors act against the feeling of having real moths crawling on your face and your body, you can't fake that." Adds producer J.R. Young: "When we saw Ole's vision of these huge moths, it was something we'd never seen in a horror movie before. It was very fresh." The film's big moth scene called for a staggering 2000 insects to invade Em's new bedroom in her father's house. In order for the moths to be ready for the sequence, they had to be shipped to the set as larvae and hatched on location. Overseeing the process was another unusual addition to the crew: Moth Wrangler Brad MacDonald. Says Robert Tapert: "We could have created the moths entirely with CGI, but Ole very much wanted the real thing. I commend him for his staunch decision to bring in the moth wrangler. The moths made the scene that much more chilling for us all." Every department had to work around the peculiar nature of moth behavior. Production Designer Rachel O'Toole designed bedroom walls that the moths would stick to naturally. Director of Photography Dan Laustsen learned to light the set so the moths wouldn't be completely distracted by their attraction to bright objects. Later, visual effects supervisor Adam Stern enhanced the creepiness factor of the moths. Most of all, the actors had to deal with the heebie-jeebies of having these insects crawling all over them. "I'm not a big insect guy," confesses Jeffrey Dean Morgan. "And these were really huge monster moths. On the first day shooting with them, one got on my bare foot, and let's just say it wasn't pretty." Adds Natasha Calis: "I was up for a challenge but these things were huge and they're like black and orange and when I saw them it was kind of like how when you go bungee jumping and at first you're excited, but then you look over the edge and it's like uh-oh. Some of them even have little spikes coming out of their legs and are sharp on your skin." Still, Young was impressed with how well Natasha kept her composure within the invading storm of moths. "She was a real trooper," he says. As for moth wrangler Brad MacDonald, at the end of the day, his only comment was, "I prefer working with snakes." To keep the curse of the real-life Dibbuk Box at bay, Ole Bornedal decided to recreate a box that would hopefully protect cast and crew. Like the actual container that was auctioned on Ebay, the film's box needed to be ordinary enough not to arouse immediate suspicion, but mysterious enough that it could, in Bornedal's words, "symbolize the evil we all hope to keep trapped forever." Explains J.R. Young: "It was less important for us to recreate the actual box as to create a box you believe might contain something that was locked away to never be let out in the world. Rachel O'Toole came up with some great concepts, and we also went back to the original story for the contents, including the bird skeleton, the locks of hair and the strange wooden carvings." For the demon itself, the production turned to makeup special effects designer Bill Terezakis. "How do you give face to a demon? What is the face of evil?" asks Young. "Bill and Ole came up with a design that would embody this. Their vision was to ask not how much can we show, but how little can we show to completely shock you?" Without giving anything away, Terezakis notes: "Ole wanted something that would feel very ancient and I think we delivered on that." Adds visual effects supervisor Adam Stern: "We really wanted to create something that was not only scary but also grounded in reality as much as possible." For Robert Tapert, that hope of creating something that lingers in the imagination, that continues to make your heart pound long after the final images, was the driving force behind the entire creative process on The Possession. He concludes: "We want audiences to leave the theater with the feeling that, since the horror you just witnessed is based in fact, it could come calling for you. The idea of the Dibbuk Box is something we think will scare audiences not just in the theater, but after they leave." Natasha Calis stars as Em in THE POSSESSION, a film directed by Ole Bornedal; also starring Jeffrey Dean Morgan, Kyra Sedgwick, Madison Davenport, Grant Show and Matisyahu. Picture courtesy Lionsgate. All rights reserved. Stephanie (Kyra Sedgwick) and Hannah (Madison Davenport) in THE POSSESSION, a film directed by Ole Bornedal. Photo credit: Diyah Pera. Picture courtesy Lionsgate. All rights reserved. Jeffrey Dean Morgan stars as Clyde in THE POSSESSION, a film directed by Ole Bornedal. Photo credit: Diyah Pera. Picture courtesy Lionsgate. All rights reserved. Tzadok (Matisyahu), Em (Natasha Calis), Clyde (Jeffrey Dean Morgan) and Stephanie (Kyra Sedgwick, right) in THE POSSESSION, a film directed by Ole Bornedal. Photo credit: Diyah Pera. Picture courtesy Lionsgate. All rights reserved. Tzadok (Matisyahu) and Em (Natasha Calis) in THE POSSESSION, a film directed by Ole Bornedal. Photo credit: Diyah Pera. Picture courtesy Lionsgate. All rights reserved.